Spitbucket is an independent blog with all opinions being solely my own. Maybe a little of my wife’s because…well, marriage. 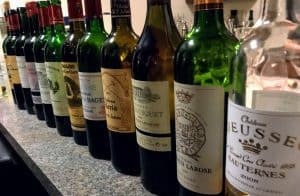 The vast majority of the wines featured on this blog are items that I’ve purchased myself–often from a variety of sources. Others will be wines that I’ve experienced at tasting events, dinners or winery visits. I am open to accepting samples from wineries for review with the following conditions. 1.) All samples received will be noted as a sample in its review. At this time, I am only open to receiving samples of wines or wine books. I’m not interested in paid promotion opportunities or underwritten posts. I may be interested in reviewing products but would need to know more details. 2.) Acceptance of samples does not guarantee a review. I will review wines on a time table of my convenience that works with my scheduling calendar for posts. I will not review wines that are faulted or that I seriously do not like. 3.) I maintain 100% editorial control over the content of the review. You are welcomed to submit tasting notes and promotional materials that highlight what is unique about your wine and winery. In fact, I would eagerly like such details as often they are lacking on many winery websites. While I will try to focus on the positives and who may like a particular wine, I do not guarantee a 100% positive review. 4.) Wineries are welcomed to post my review on their web-page, newsletter and social media with a relevant link to the original blog post. As long as attribution is provided, wineries have my full consent to use the review as they like. On my end, I will promote the post via my social media channels of Twitter, Instagram and Facebook.